As you know from our post last week, we are all about cosleeping and it works well for our family. However, we do have a room for the kids where they will eventually sleep, for now it is more like a play room than a bedroom. No matter what your sleeping arrangements, the following will help guide you in creating a living and sleeping environment that is less toxic and your kids can play safely in. It's unfortunate that today we are surrounded with products that are inherently toxic and contain chemicals that cause cancer, asthma, and other diseases. It's wise to mindfully choose what finishes, flooring, and furniture to include in all your rooms - not just the kids. The first thing you need to determine is whether your home may contain lead paint. As a general rule, if your home was built before 1960, it most likely contains lead paint. Even homes as recent as 1978 may contain lead paint. It is considered to be the #1 environmental threat to children in the U.S. It's a concern that shouldn't be taken lightly. Children may be exposed to lead through dust, contaminated soil, and construction projects. Lead paint is best left undisturbed unless it is in an area where it would create a lot of dust (like windows or in the midst of a remodeling project), that's when it should be professionally removed. Check out the EPA lead-based paint page for more information. When choosing wall paint for your home and especially the baby's room, it's best to go with zero or low VOC paints. Volatile Organic Compounds in paints, finishes, and building materials can cause eye and respiratory tract irritation, headaches, memory impairment, among other things. Some organic compounds are known to cause cancer in animals and/or humans. Of course you are familiar with the smell of paint - that's exactly what humans and especially children shouldn't be smelling! Yes, you will most likely spend more money on such paint, but it is absolutely worth the investment for your child's health. Performance wise, our two favorite brands or zero VOC paints are Mythic Paint (on Amazon or use the store finder) and YOLO Colorhouse (on Amazon, at store near you, and at select Home Depot stores). Both have amazing coverage and no toxic smells, you can even paint while pregnant without ill effects! Some other brands that make zero or low VOC paints are Olympic Paint, Bioshield, Homestead House Paint Company, and Anna Sova. Most flooring contains toxins that off gas over time, both in the material itself and the adhesives. In general, stay away from any PVC/vinyl flooring (most toxic) and synthetic carpets with traditional adhesives. Carpets will off gas for years and contain formaldehyde. Laminate flooring can also be quite toxic because of the adhesives used to make it, but some contain lower VOC content than others. We recently installed IKEA TUNDRA laminate flooring and we are pleased with it, it has no smell whatsoever and adheres to stricter environmental standards than U.S. based products. Is it the least toxic? No. 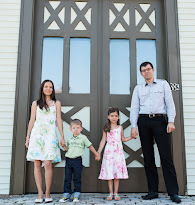 But for a family on a budget it works. Look for FSC certified backing and no added urea formaldehyde in laminate flooring. The best flooring options would be hardwood sealed with a zero or low VOC floor finish, such as Vermont Natural Coatings. Another option is sustainable carpets and rugs made from natural materials (such as wool or bamboo) without chemical treatments. Look for carpets with natural fiber backing and less-toxic adhesives. Some options may be Fibreworks, Merida, Georgia Mills, GreenSage, or bamboo area rugs. Ceramic flooring is another great non-toxic option, especially in warmer climates. It may also work well under a natural fiber rug, such as wool. Steer clear of polyester and other synthetic fibers in the kids' bedroom, or even in your entire home. These petroleum based fibers are full of heavy metals, among other things. It is also wise to avoid textiles with stain resistant coatings (Teflon chemicals). The best materials for bedding and bedroom accessories are organic cotton, organic bamboo, merino wool (other wool may be itchy), and hemp. Our must have baby sleep accessory is a merino wool baby sleep bag, it's priceless when it comes to keeping baby warm at night without having to chase the covers. An organic/natural crib mattress is another must have since baby will be spending a good chunk of his day on it, inhaling anything that may off gas. Some great ones are Lullaby Earth, Nook, Naturepedic, and Greenbuds. They are definitely worth it and are priced reasonably, as low as $169. If you co-sleep, you may want a spacious non-toxic mattress for the family, but that comes with a hefty price tag. We don't have one yet because it certainly is an investment. If we were to buy one, I would love an Essentia mattress - top of the line in natural memory foam mattresses. It's unfortunate that furniture today is made with many toxic adhesives, sealants, and chemicals. Upholstered furniture usually contains toxic flame retardants. Most mass-produced furniture is made from particle board that utilizes glues made with formaldehyde, it off gasses over time. You may be pleased to learn that IKEA is a leader in reducing or completely omitting the use of formaldehyde in their furnishings. Sure, it's not the most environmentally friendly company and furniture, but it is way ahead of most others. To reduce exposure to toxins, choose furniture made from solid wood and metal, or plywood/particleboard that does not contain formaldehyde-based glues. Some nursery furniture manufacturers that are worth looking into are Atlantic Furniture, Oeuf, Pacific Rim, Green Cradle, Babyletto, and Romina Furniture. Another great way to buy high quality wood furniture is at yard sales and second hand (such as estate sales and Craigslist). Of course a healthy baby room doesn't end at creating one, it's best to keep it clean by using natural non-toxic cleaners. You can make some yourself or use some that are truly natural, we are big fans of Better Life products in our house. 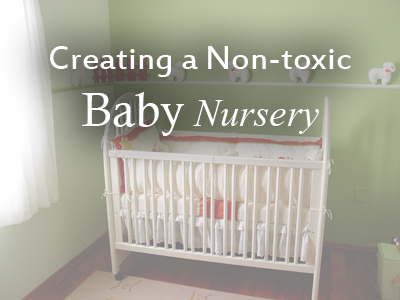 Do you have more tips for creating a non-toxic baby nursery? My baby girl's nursery is just to bright for her to nap in during the day (she wakes after 10-20 minutes), and I am looking for some blackout curtain panels. Any suggestions for non-toxic ones? So sorry I haven't replied to your comment! Somehow I missed it. The most non-toxic option would be to make some from organic cotton fabric and just line them so they are double in thickness. But I'm not crafty like that and assume you may not be! :) I just bought some Eclipse curtains at Target and they blackout very well. They are polyester and I'm not a fan of the material at all, but I let them air out and kept the windows open for many days after hanging them, they didn't have much of a smell to begin with. I just learned about organic crib mattresses. Wow! Wish I knew then for my 3 boys (2 are currently in college and the 3rd is 5 years). Thank you for this informative article. I love reading your blog. You have enlightened me. You're welcome and thank you so much for your lovely comment! This post is timely! We are renting a house built in 1950 and the tips about lead are great. Also if we want to remodel soon I like the flooring ideas too, and non toxic paint.